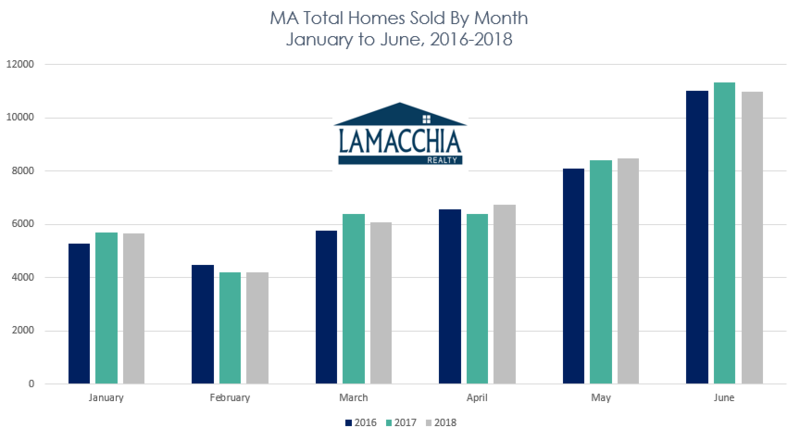 This Lamacchia Mid-Year Housing Report presents overall home sale statistics as of the first six months of 2018 compared to the same period last year, January 1st to June 30th, 2017. 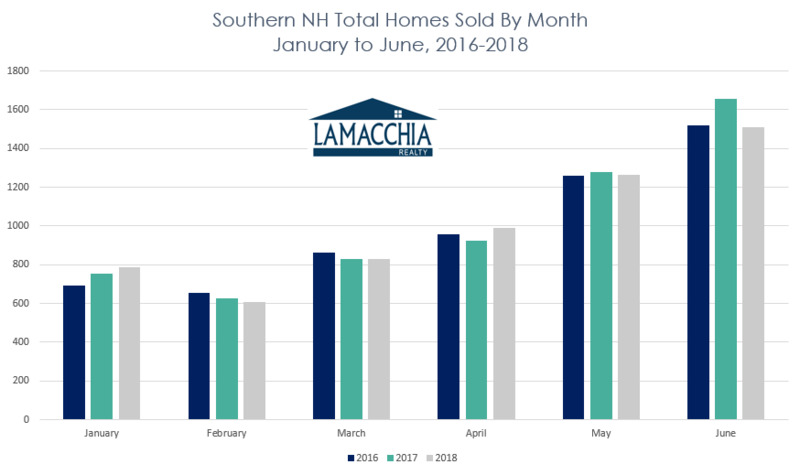 Highlighted in this report are the average sale prices for single-family, condominiums, and multi-family homes in Massachusetts and New Hampshire. 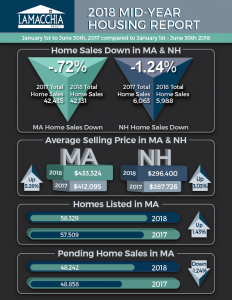 This year’s slight decrease in total home sales for Massachusetts and New Hampshire compared to last year’s slight increases are a result of the lowest inventory on record that kicked off 2018 and continued through spring. 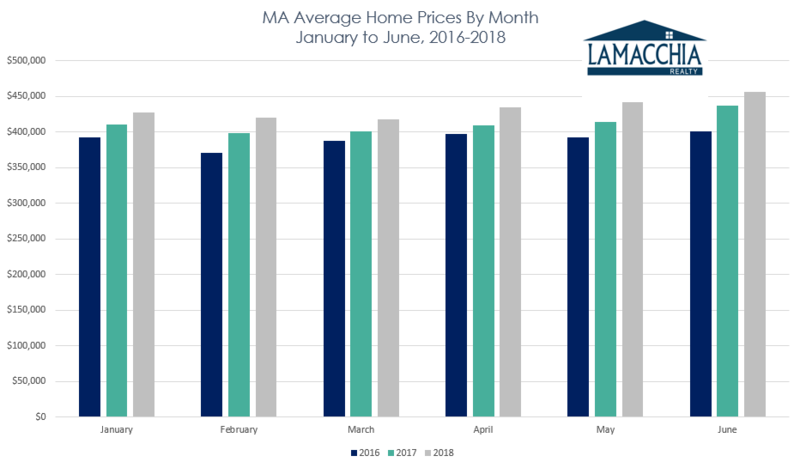 The increase in average price for this year was also related to the low level of inventory, as many homes sold for over asking in multiple offer situations, which drove prices up and caused homes to sell very quickly. This year’s low inventory in Massachusetts lasted longer than we’re used to, as mentioned in our blog, Don’t Worry Buyers, Nothing Lasts Forever. Furthermore, the balanced market we look forward to in the summer happened later than we expected as well. Homebuyers experienced a frustrating winter, as many competed for homes that ended up selling in bidding wars, thereby driving the sale prices up. Many would-be-sellers hesitated to list their homes due to the lack of homes on the market for them to purchase. Sellers were worried that if they listed their homes, they’d sell too quickly to find a home to purchase, effectively leaving them homeless. That worry and hesitation that caused sellers not to list directly correlates to 2018’s very low inventory and slight decrease in home sales, which is down from 42,435 to 42,131 in 2018. As depicted in the graph below, April was the only month where sales increased over 2017, as the rest of the first half of 2018 showed fewer sales or were relatively flat-lined compared the year before. Overall home prices increased by 5.26% from January 1st to June 30th with an average of $433,324 for singles, condos and multifamily homes compared to $412,095 in the same period in 2017. The increase in average price is right on par with 2017 when the increase was 5.5% over 2016. As many homes sold for over asking in multiple offer situations in the first half of the year, which is often the case with a shorter supply of homes listed on the market, this increase isn’t very surprising. These bidding wars in a low inventory market have become the norm over the past couple of years and there’s no sign of any dramatic change for the rest of the year. Overall home sales were down 1.24% from January 1st to June 30th with 5,988 homes sold compared to 6,063 sold in 2017. Just like Massachusetts, the lack of inventory and the constant bidding wars made it worrisome for would-be sellers to list as they were concerned about finding a new home to purchase. From the graph below, we see that January and April saw the only notable increases in home sales in 2018. The rest of the year, like Massachusetts, were either decreases or no change from the year before in the number of homes sold. 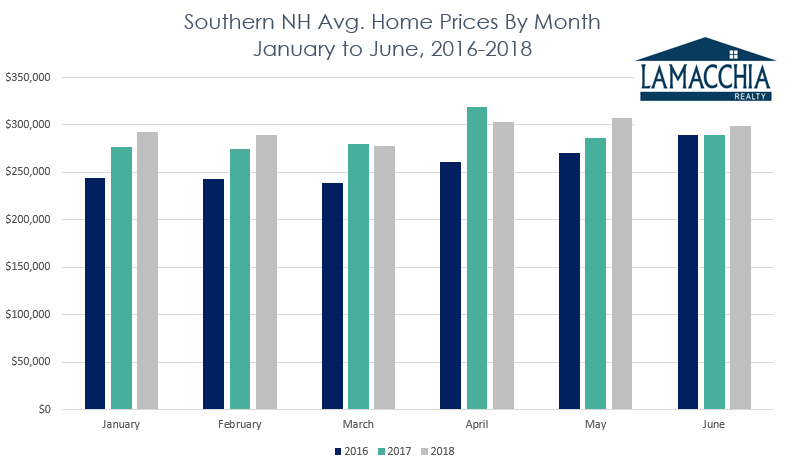 New Hampshire’s home prices rose 3.03% with an average price of $296,400 compared to an average of $287,726 in 2017. This slight increase is much less than what we saw in the 2017 report which showed an 11.6% increase in prices. New Hampshire’s inventory wasn’t as tight as it was in Massachusetts, so less bidding wars incited less of a jump in prices. There were 57,509 homes listed for sale in the first six months of 2017 according to MLSPIN compared to 58,329 this year. That represents a 1.43% increase in the number of homes listed. January and March saw decreases in homes listed, and every other month leading up to the end of June showed increases in the number of homes listed. It really took until June for homes to begin getting listed on a more frequent basis. It goes to show that inventory was down this year not because there wasn’t supply, but because supply couldn’t keep up with demand, as explained by Anthony Lamacchia in this Globe article. Pending numbers tell us total contracts accepted but not yet closed and this number is the best indicator of future home sales. The number of pending home sales is down by 1.24%, from 48,858 in 2017 to 48,242 this year. That’s only a difference of 614 homes year over year. 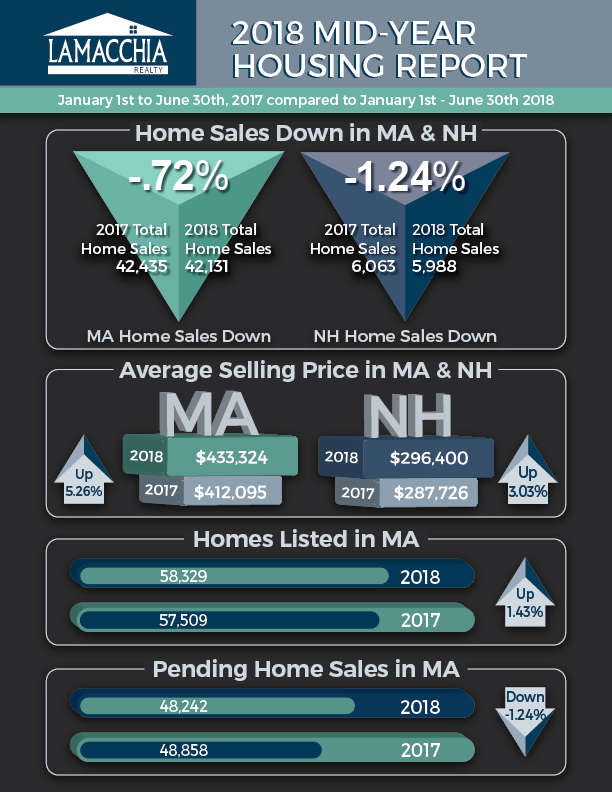 Pending sales have been up and down over the past six months in Massachusetts indicating that the market has been affected by how quickly buyers were competing for homes that became available and as well by the hesitation for would-be sellers to list. This was a very late start to the year due to it taking forever for the vast majority of home sellers to list their homes for sale. June was the first month of the year that we saw a large increase in homes listed and the market really turned on after that happened. We did see a slow down for about week following the July 4th holiday, but it picked right back up strong after that week, which is expected and tends to happen every year. However, as Anthony described in his June 25th market update, home sellers are now getting a wake-up call because homes are not selling as fast as they were or for as much as they would have in early spring. This is always tough for a seller to accept and understand. But it’s simple supply and demand economics. The outlook for the rest of the summer is strong as all signs point to an active summer that should most definitely be more active than last summer due to the late start this year which will push the busy season through the summer. At this point, it’s hard to say what fall will be like as it’s a bit early to predict but it should remain fairly active. Fall is always the time of year that inventory peaks which makes it the best time to buy. If a home seller is realistic about their price, there is no reason that they should not be able to sell in the months to come.